The perfect bedtime cuddle-up! 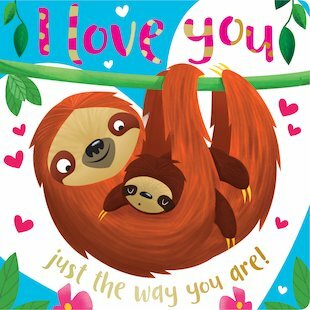 A little sloth and his baby animal friends learn what it means to be loved. When Little Sloth wakes up, he’s as grumpy as can be. But his loving mummy says, ‘that’s alright with me’. His friend, a timid turtle, is shy and tries to hide. But that’s okay – his mummy is always by his side. Turn the pages to find more adorable baby creatures and the mums, dads, brothers and sisters who love them oh-so-much. Rhyme the rhymes and smile at the colourful pictures as you snuggle up with somebody you love.